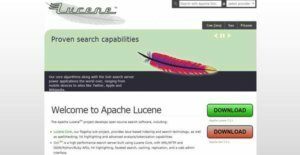 Apache Lucene is an ultra-fast, powerful, and full-featured text search engine library developed to empower mobile applications, websites, and solutions with search capabilities so they can deliver a seamless search experience. It is a part of an open source project initiated by Apache Software Foundation, a community of open source software developers that are committed to building and enhancing innovative technologies. Written in Java, Apache Lucene functions as an indexing and search technology that allows the implementation of full-text search capabilities and efficient indexing processes on applications and websites that are running on multiple platforms. Apache Lucene is equipped with search algorithms that ensure that app users and site visitors are able to find the exact content they are looking for, permitting users to enable and support various types of search queries, rank and group search results, apply flexible faceting, use fielded searching, and more. Last but not least, Apache Lucene is using the Apache License, an open source license that allows users to use, modify, and distribute the software for business purposes or open source development projects. As an indexing technology, Apache Lucene offers a feature called incremental indexing. This feature allows users to add, change, or remove documents in their index without the need to re-index all contents within the index. By using timestamps, the index will identify the documents that were newly created, modified, or deleted, and what will be re-indexed are only those contents related to those documents. This feature is very advantageous for users who are managing a large database and who need to change their data often like network publishers. The indexing capability of Apache Lucene is scalable and has a high performance. In fact, it lets users process a large number of documents and index them in less time. This is because the search engine library supports the indexing of over 50 GB of documents or data within an hour. In addition, as they perform indexing, they only need to allocate a minimal amount of RAM for such task which is 1MB heap. Apache Lucene makes it easy for searchers to find any information or content they need. Through the aid of its powerful, accurate, and efficient search algorithms, users will be able to precisely deliver whatever searchers are looking for. This makes the search engine library a truly world-class search technology that can handle sophisticated searches and generate search results in an advanced and modern way. For example, accurate searching can be implemented by enabling a fielded search functionality on websites and applications. Basically, searchers are looking for pieces of information that are stored in a database and are defined and labelled in the search index during the indexing process. These pieces of information are organized in specific areas called fields. The most common types of fields are author, title, subject, and abstract fields. For example, the author field contains the names of authors of books or articles, the titles of these books or articles are found in the title field, words or terms used in the books or articles are organized in the subject field, and the overviews of the authors’ works can be accessed from the abstract field. In a basic type of search, the database normally finds information from all of the fields after a searcher makes a query. Thus, if fielded searching is not enabled, someone who is searching for a particular article will view short results that contain the name of the author of the article but he or she will also see articles that mentioned the author and discussed the work of the author. Thus, field searching is a way of instructing the database to look for information only from a specific area or field so searches won’t be overloaded with pieces of information which make it difficult for them to find the information they need. Apache Lucene also enables users to rank their search results so that searchers will be able to see first the contents that are most relevant to what they are looking for. In addition, the search engine library allows them to use different ranking models as they rank their search results which include Vector Space Model and Okapi BM25. Apache Lucene has a multi-index searching capability. With this capability, pieces of information and content are searched on multiple indices all at once. Interestingly, whatever data it gathers from each index can be combined together, generating merged search results where searches can dynamically view how pieces of information are being used in various scenarios or conditions. If you are interested in Apache Lucene it might also be a good idea to examine other subcategories of Best Site Search Solutions listed in our base of B2B software reviews. Every company has different wants and requires a software that can be personalized for their size, type of employees and buyers, and the specific industry they are in. For these reasons, no platform can proffer perfect functionality off-the-shelf. When you search a software product, first be sure what you need it for. Read some Apache Lucene reviews and ask yourself do you want basic functionality or do you need advanced tools? Are there any industry-specific features that you are looking for? Find the answers to these queries to help your search. There are lots of elements that you need to reflect on and these include your budget, particular business wants, your company size, integration needs etc. Take your time, try out a few free trials, and finally choose the system that offers all that you require to boost your firm efficiency and productivity. How Much Does Apache Lucene Cost? We realize that when you make a decision to buy Site Search Solutions it’s important not only to see how experts evaluate it in their reviews, but also to find out if the real people and companies that buy it are actually satisfied with the product. That’s why we’ve created our behavior-based Customer Satisfaction Algorithm™ that gathers customer reviews, comments and Apache Lucene reviews across a wide range of social media sites. The data is then presented in an easy to digest form showing how many people had positive and negative experience with Apache Lucene. With that information at hand you should be equipped to make an informed buying decision that you won’t regret. What are Apache Lucene pricing details? What integrations are available for Apache Lucene? If you need more information about Apache Lucene or you simply have a question let us know what you need and we’ll forward your request directly to the vendor.